Our bookshelves are jammed full with books meant for elementary and middle school teachers. Donald Graves, Nancie Atwell, Georgia Heard, Katie Wood Ray, Ralph Fletcher, the gals at Two Writing Teachers — these are the teachers who have taught us how to teach writing, who continually push us to reconsider what we think we know about the students we teach. And they are also the teachers who inspire us to acts of translation — taking strategies designed for children and converting them into strategies for our teenagers. When teachers ask us if it could work the other way around — could they take the strategies we use with our high school students in Writing With Mentors and use them with their younger students — our answer is a resounding YES! Real writing is a result of studying real writing. Above all, we want our student writers to craft with the conviction that what they are doing is real. Not for school. Not to please a teacher. Not to get a grade. But as a way of participating in a larger, global conversation of thinkers and writers. We do this by exposing our students to the work of real writers and encouraging them that they can do the same. When their eyes have been fixed to authentic products of real-world professional writers throughout the course of the writing study, their own product follows suit. Dreaming of writing for Grantland or Vulture might be too remote for students still in elementary school, but they can easily aspire to the real writing composed by Times for Kids’ kid reporters. Whether it’s the latest review from The New York Times’ amazing book critic Michiko Kakutani, whose work always heightens and enlivens the writing of students who study her work, or an article about a new link in the evolutionary chain in National Geographic Kids, teachers should be supplying their students with a constant and steady stream of authentic products by writing professionals. Students benefit from studying hot-off-the-presses mentor texts. We want students to see that writing is alive, vibrant, dynamic, speaking to the world we live in right now. So, we don’t want to only show our students the classic texts — we want to show them what was published just this month, this week, even last night. A student is engaged when they feel privy to an insider’s view of the writing life as it happens. Using mentor texts that are hot-off-the-presses brings this work to life for our students. In a study of current commentary, my high school students might study Leonard Pitts’ blistering commentary this week on the loss of privacy in America following the Ashley Madison leaks, but your middle schoolers could easily study Mitch Albom’s less touchy commentary asking if sportsmanship is indeed dead. Students need to study multiple mentor texts in each writing unit. When we provide students with a single model, we get a single result. 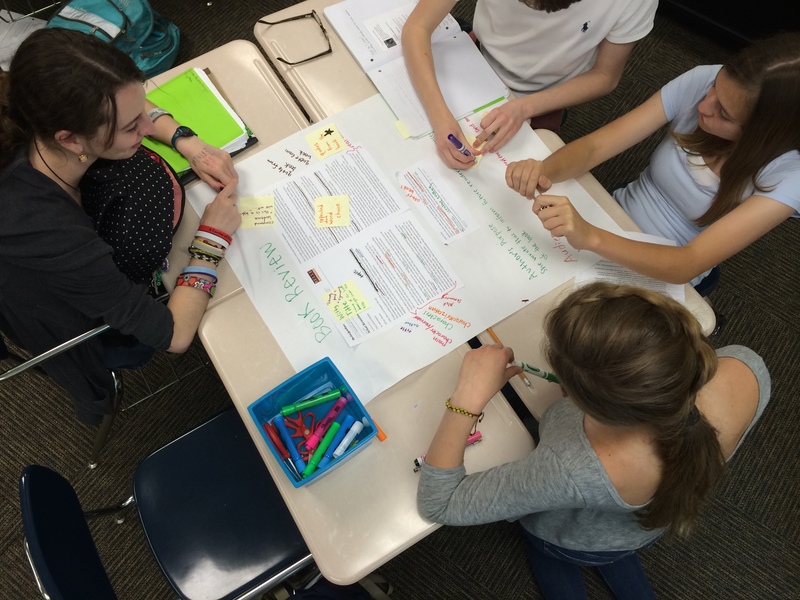 Students need to see myriad writers tackle a single genre or use a particular craft element. They need to see that even when achieving the same ends, writers make unique choices — the same writely choices that they, too, will need to make when crafting their own piece. We think that between three and six mentor texts per study is just right — showing lots of options without overwhelming student writers. These options become like a Rolodex of possibilities students can fan through and consider while writing. Give your students a packet of scenes from six novels to inspire them to write their own or get recommendations from Jen Vincent at teachmentortexts.com and stack picture books on students’ tables to help them compose their own. Mentor texts should be used at every phase of the writing process — from prewriting and play to planning to drafting to publishing. Mentor texts are often used at the beginning of a writing study to provide students with a template for the piece that they will eventually write. But mentor texts can do far more than just help writers envision the final product. Mentor texts provide models for writerly play and experimentation during notebook time, help writers conceptualize both content and structure before they begin drafting, provide a bridge to help writers out of the weeds in the midst of writing when they get stuck, have questions, or don’t know what comes next. Mentor texts can help writers polish their writing, and help writers get their work published. Stay tuned for how these principles play at as we move students from play to publication with mentor texts as the guide. In the meantime, what are your non-negotiable, fundamental beliefs about student writing? What foundations of your writing instruction are applicable to writing instruction for all students, regardless of their age? We’d love to hear from you! Comment below, shoot us an email, or find us on Twitter @rebekahodell1 and @allisonmarchett.